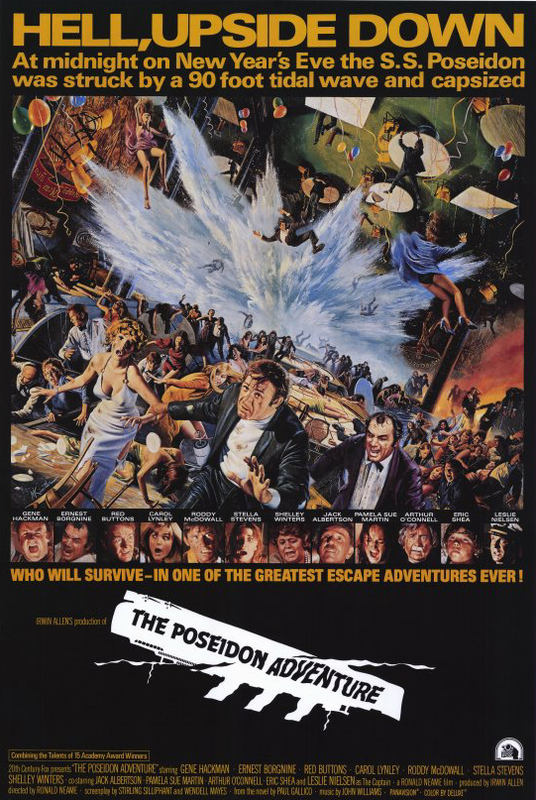 If you’re only as good as your last film, and especially as good as your last film’s receipts at the box-office, then film director Ronald Neame must have been at his peak when “The Poseidon Adventure” (1972) was released, the first and most successful of a string of all-star cast disaster films made during the 1970s. But was he really? I had my doubts. Why? Simply because British-born Neame, a survivor of a generation of film pioneers and alive and kickin’ at 92 when I met him in Beverly Hills in 2003, was an all-round cinematographer-screenwriter-producer-turned-director of various screen classics made throughout the entire 20th century. When we were talking, Mr. Neame said at one point: “I went all the way through the growing pains of sound, the aggravations, the irritations, with the cameramen in the camera booth, sound people in the sound booth – the bloody great microphone had to be only one inch above the actor otherwise the sound was no good, there were shadows all over the walls, everybody had a miserable time till we really got used to it. And look at us,” he smiled, “here we are now!” Voilà! Could you tell me a little bit about your background? Who were your parents? My father, Elwin Neame [1887-1923], was a photographer-director who directed my mother in 1908. He was also probably the best still photographer in London at that time. He had a very good reputation at age 23 for photographing beautiful women, lovely portraits of women. He always used twelve by ten negatives. On the wall of every subway station in London, opposite the platform where you stood, there was a picture of a beautiful woman with underneath the caption If it’s a Neame, it’s you at your best. In 1908 the Daily Mirror ran the first World Beauty competition and my father was asked to photograph the twenty-five finalists. My mother was one of the twenty-five he photographed. She won the competition and he married her. She became a very important silent film star and so, when I was six weeks old, I was carried on to the set – my first set – and I grew up, surrounded by film. My mother, Ivy Close [1890-1968], went to France and also came to America – this was all before Hollywood even existed – she went to Florida to work in the Kalem comedies. She then was spotted by [French film director] Abel Gance [1889-1981] and she played the lead in the film “La Roue”  which he made just before “Napoleon” . I was with her on location when I was 10. After my mother had died, they ran the film again here [in Los Angeles] at the New Art Theater, and I thought, I’d love to see what my mother was like as an actress. 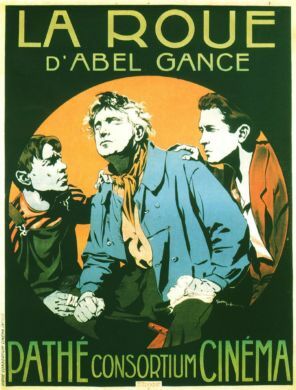 So I went to the Theater, there were lines all around the theater for this silent Abel Gance film. People wanted to see it, because they had just run “Napoleon”. I asked the manager, ‘I have a very special reason for wanting to see this film, so I would like to avoid the lines, but I don’t want to get in for nothing. I will pay for it.’ He asked, ‘May I ask what this special reason is?’ I said, ‘Well, the leading lady was my mother.’ And it was amazing. He took me in, he sat me down, he introduced me to the audience and for the first time in my life, I saw my mother up there on the screen when she was a young woman. You started at the bottom: in 1927, you joined Elstree Studios in London as a messenger boy and call boy before moving up to still photographer and assistant cameraman with Hitchcock’s “Blackmail” as his first major assignment. How did that come about? When I was 12, my father was killed in a motor accident  and as my mother had to go on tour with the theater – she had to make money – I went to boarding school for a year, but at the end of the first year, there wasn’t enough money to keep me there, so I had to go to work. When I was 15, I had my first job as a messenger boy until my mother – bless her heart – got me an interview with the studio manager of British International Pictures at Elstree, resulting in jobs as a messenger boy and a gopher. Eighteen months later I was fortunate enough to be assistant cameraman on Hitchcock’s “Blackmail” which was a silent film. In came sound, we then made sound sequences and turned it into a sound film. Do you still remember those days working for Alfred Hitchcock? It’s very difficult for me to enlarge too much on Hitchcock [1899-1980], because I only made that one picture with him, and I was only 16 at the time. He came to Hollywood shortly after that and spent the rest of his life over here while I remained in England for many years. But whenever I came over here, I always met him, right up until the end. He knew exactly where he wanted the camera, he knew exactly where he wanted to cut it and he wanted the actors exactly to do what he wanted them to do – without any argument. And so there were certain actors that didn’t like him. Any film he made always was a Hitchcock film, and not all actors liked that. He once said that actors should be treated as cattle. He really said that and he really believed that actors had to do exactly what they were told to do, do less rather than more. In Russia they once did an experiment: there was a close-up of a man, looking past camera and down side. They shot fifty feet or a hundred feet of the man, just looking. They then cut from, let’s say, a motor accident to the man: the man looked shocked. They then put a feast with wonderful food and cut to the man and back to the food: the man looked hungry. They cut him in the same shot into four or five different situations and he figured them all. That is what Hitch believed in: if the actors did exactly what he wanted them to do, then it would be fine. But you have to remember that actors are not cattle. [British film director] Carol Reed [1906-1976] for example was exactly the opposite: he believed that actors were like racehorses, like royalty. You had to lead them very gently, you had to pad them, encourage them and if you’d pull them too hard, they’d fight against you. David Lean didn’t like actors collectively, but he knew they were tremendously important to him, so he did everything he could to get good, great performances out of them. What about Alfred Hitchcock: was he, as often speculated, ahead of his time? He was way ahead of his time. “Blackmail” used sound in a more imaginative way than it was used for years. Hitchcock was Hitchcock: he was unique, he was cruel, he used to be a great practical joker – he loved playing jokes on people, some very weird jokes too. He once gave a big party at the Regent Palace and invited anybody who was of any importance in theater and film, amongst them a very famous stage actor who was also a knight. Hitch had told this actor it was a fancy dress party and that he was expected to come as a warrior or as a knight, dressed up. So all the guests arrived and the only one dressed up was this actor. Hitch thought this was very funny, but it was tremendously embarrassing for this man. To make matters worse, when it was dessert time at the dinner tables, the doors opened and in came a naked woman who sat on this actor’s lap. That was one side of Hitchcock, the practical joker, but you didn’t play jokes on Hitch. He didn’t like that. I never made another film with him, but I knew him all his life. The last time I saw him, was at the time when I was shooting “Meteor”  with Sean Connery and Natalie Wood. Hitch was in a wheelchair when the British-American Chamber of Commerce made him Man of the Year and they had asked me to introduce him. As I went up to him – we hadn’t seen each other for three or four years – I said, ‘Do you remember me, Hitch? Ronnie Neame?’ He looked up, he smiled and he said, ‘You were one of my boys! You’ve grown sideburns, Ronnie!’ That was our last meeting, we had lunch and he died just a few months later. “Happy”  starring Stanley Lupino [the father of actress-director Ida Lupino], was one of your earliest achievements and the start of your career as a cinematographer? When I worked on “Happy” – I was barely 20 at the time – I collaborated with Claude Friese-Greene who was the son of the man we claim invented the motion picture camera, William Friese-Greene [1855-1921]. Now, France claims [Louis] Lumière [1864-1948, with brother Auguste, 1862-1954] and America claims [Thomas A.] Edison [1847-1931] invented it. Edison had the money to keep the patents going, while Friese-Greene was broke. I’m sure all three of them were ready about the same time, film was due to arrive. Many years later, I produced a film called “The Magic Box” , the Friese-Greene story, and for that film we took as much as we could from his life, but of course his family wanted him whitewashed, they wanted him presented as a sweet, lovely man, although he drank very heavily and he was always in debt. He died in poverty, attending a meeting of distributors, pleading for the film industry to work together instead of different fractions fighting each other. During the 1930s, you made several British films, but meeting director David Lean (1908-1991) was the turning point in his career, I suppose? Absolutely. We took an immediate liking to each other and first worked together with “In Which We Serve”  which was very nearly cancelled. At that time we couldn’t work without the help of the various Ministries and the problem was we couldn’t get any facilities, we couldn’t get any wood for the sets, we couldn’t get any steel. They were against it, they thought it was a ridiculous film to make in wartime: the story of a British destroyer being sunk by the Germans, that’s not the kind of film they wanted. They considered it would be very bad propaganda, so they wanted us to make films about German ships to be sunk. Lord Mountbatten, who was a great film fan and a great personal friend of [the film’s co-director, screenwriter, composer and leading actor] Noel Coward’s, was Chief of Combined Operations during the War, and he got us the material to make the film. He even loaned us real sailors to be our extras. That was a wonderful experience, so much that David and I stayed together. Newsweek described “In Which We Serve” as ‘one of the screen’s proudest achievements at any time and in any country’. I’m sure this film paved the way for “This Happy Breed”  and “Blithe Spirit” [1945”? That’s right, and after completing those films, I was sent to America by [Lord J.] Arthur Rank [1888-1972] to go to all the studios and find out what we needed in England to bring ourselves up to date at the end of the war. So I came over here in Los Angeles and had the most extraordinary, wonderful six weeks, because I was treated like a lord. Not because I was somebody, but because I was representing Arthur Rank with his eight hundred theaters. So you can imagine how well I was treated. The first thing they asked, was, ‘Would you like an office?’ I said, ‘That would be very nice.’ ‘You need a secretary?’ ‘That would also be very nice, because I have to send a report back to Rank.’ They said, ‘Do you prefer blondes or brunettes?’ And as a joke (laughs), I said, ‘I really like red-heads.’ And the next morning, in my office, there was this gorgeous redhead secretary! I wasn’t complaining!” (Laughs). This was your golden era of filmmaking? Looking back, the era of filmmaking which I particularly love and which we call ‘The Golden Years’ was when David Lean and I came together as friends, when I shot films as “Major Barbara”  and “One of Our Aircraft Is Missing” [1942, both edited by David Lean]. 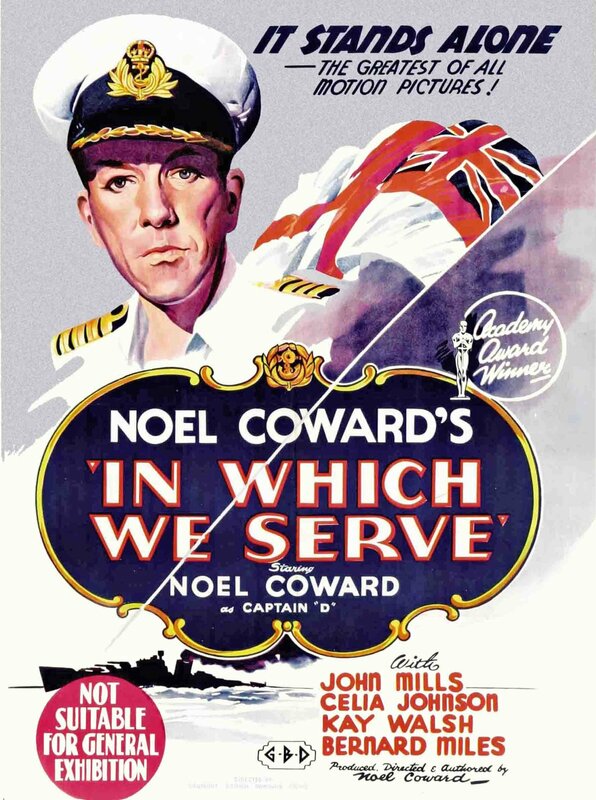 When Noel Coward wanted to make an epic about the War, “In Which We Serve”  came along and compared to those films, I am certainly not proud of “The Poseidon Adventure”  as a piece of film, but, you see, a few years ago, we had the thirtieth anniversary on the Queen Mary, which was the ship we used for our locations. And where does “Brief Encounter”  fit in? It still is one of the decade’s most notable films: intelligent, magnificent, atmospheric and, even shot in black-and-white, it looks so colorful. ”Brief Encounter” was a wonderful picture and it was made during the wonderful years when we made the films we wanted to make, the way we wanted to make them and we were able to cast whoever we wanted to cast. Arthur Rank just said, ‘Okay David and Ronnie, I trust you, if you want to do another Noel Coward play, that is fine with me.’ And so we got together with Anthony Havelock-Allan [1904-2003], a great, wonderful man who just passed away, and the three of us made “Brief Encounter”. Noel has to be credited with a lot of thinking on the script and it’s very cleverly told in the film – that is David – starting with the flashbacks. Rachmaninov’s second piano concerto, that was Noel’s idea. He said, ‘There’s only one piece of music for this film.’ We used it all through the film. In my opinion, it is a perfect piece of filmmaking. How different from today. Today it’s all phonetic – boom, boom, boom, cut, cut cut. I think the reason is they haven’t got any decent material. They think, if we do it fast enough and if we cut around quick enough, it will be all right. If something is well done, if you got a wonderful actress or a wonderful actor, you don’t have to cut all the time – just let it play. I don’t think I could make films today, there’s no way. The last time I came near to a film like “Brief Encounter”, was I think “The Prime of Miss Jean Brodie”  with Maggie Smith. 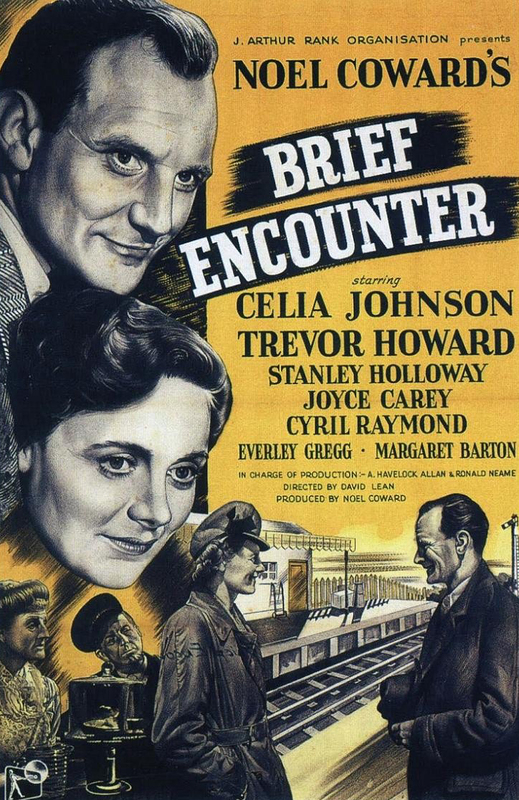 For the film’s leading actors Trevor Howard and Celia Johnson, “Brief Encounter” was their breakthrough film, wasn’t it? It also earned Celia Johnson an Academy Award nomination as Best Actress. 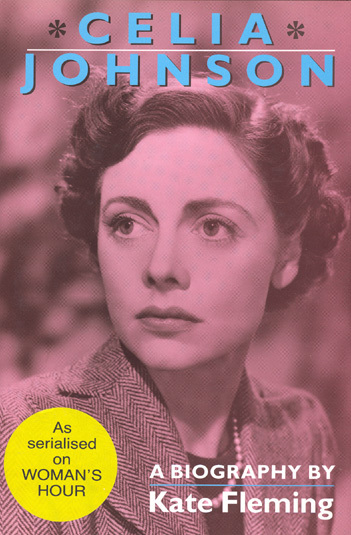 You see, Celia Johnson didn’t really like films very much, although she was a wonderful actress. She preferred being at home, she was the most un-actressy actress I have ever met. We were shooting “Brief Encounter” during the War and we had to work a six-day week, but we always let Celia go at twelve o’clock on Saturday, because she had a long train journey back to where she lived. One particular Saturday, we worked up until twelve, she was just about to go, but we were planning to shoot another sequence and David said, ‘Celia darling, can you just stay another ten minutes and run through the next sequence, so that we got it in our minds how we will set it up next Monday morning.’ Celia said, ‘That’s very unfair of you, you promised that I could always leave at twelve o’clock on Saturday and a promise is something which you should keep.’ So I said, ‘Celia… just once.’ She said, ‘All right, but let’s make it quick.’ So, we rehearsed a five minute sequence and everybody on the set, the entire unit, were in tears, electricians, carpenters,… She played it sooo beautifully. And at the end she looked at her watch and said, ‘Can I go now, because I can just make that train? !’ Here we all were in tears and it hadn’t affected her at all! She liked acting, but it wasn’t a priority for her. 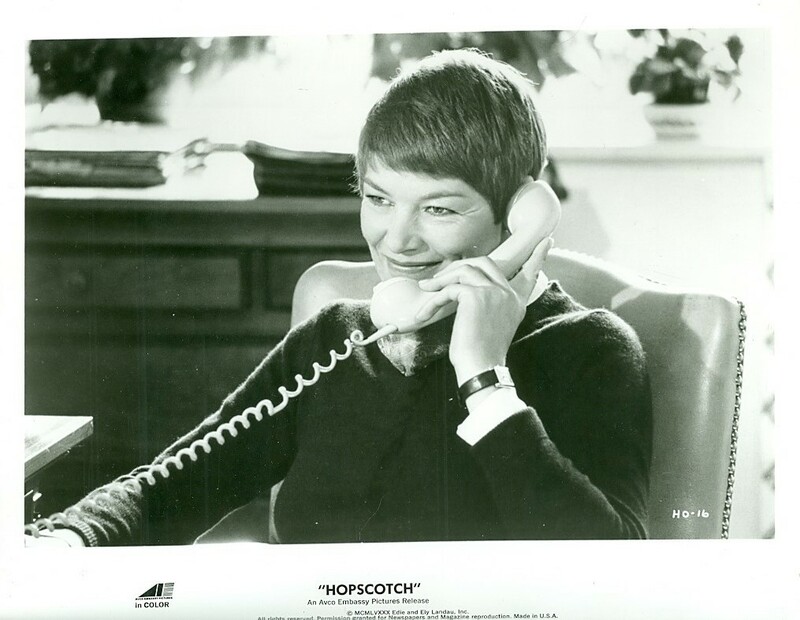 I cast her again in “The Prime of Miss Jean Brodie”, more than thirty years later, as the head teacher and again, she was magnificent. Well, David and I were at the closest in our collaboration when making “Brief Encounter” and “Great Expectations”. During the filming of “Brief Encounter”, Anthony Havelock-Allan took on the producing chores, because I was busy writing the first screenplay of “Great Expectations” and David joined me after “Brief Encounter” was finished. David made “Brief Encounter” the way we wanted it, I was in the editing room with him and it was heaven. We thought that this was going to be our life, we thought this would go on forever. But in 1950, 1951 the golden years were finished. We were out on the street again and it has never been quite the same since, although of course there have been some great pictures. According to the Rank Organization, we were spending too much money, not a lot, but too much to get the cost back in Europe. At that time, American audiences did not like British films. We tended to blame the American companies and the American distributors who we said didn’t want our films and that is not fair. The American audiences simply didn’t like our films. In the end, Rank had to pack up because we had an overdraft at the bank of about twelve million pounds, which was a lot of money at that time, and the National Provincial Bank said, ‘You’ve got to cut two million in the next year, otherwise we’re going to close the Organization.’ Arthur Rank, who was a wonderful man, had to hand over the reigns to his accountant who got the overdraft down by two million because he stopped making pictures and any theater that wasn’t doing well, was turned into a bingo hall. He finally became in full charge of the Organization. He didn’t like films, but he had to make a few more because the Rank Organization was in the hands of the Americans: they had eight hundred theaters to fill in Britain, so as a ‘bargain’ he made a few more and I went back to them to make a little picture called “The Card”  with Alec Guinness [1914-2000], a wonderful and marvellous actor, but it was very difficult to get him to do anything other than what he wanted to do. Every film he made with David, they’d fight and would swear they’d never make another film together again. But of course, their films were always so good that they had to work together again: both of them realised that working together, they made wonderful films. So you’d see him in films like “Great Expectations”, in “Oliver Twist”, “Lawrence of Arabia” , “Doctor Zhivago” , “A Passage to India” . In the end, David fell out with him, and I don’t know if he would have made another one. He was very upset with “A Passage to India”. David however was one of the very best directors in the world and he remains so in the eyes of most people. Another wonderful director at that time was Carol Reed. It seems I haven’t got a friend from that era, except for John Mills. Johnny is still there, we talk to each other on the phone. 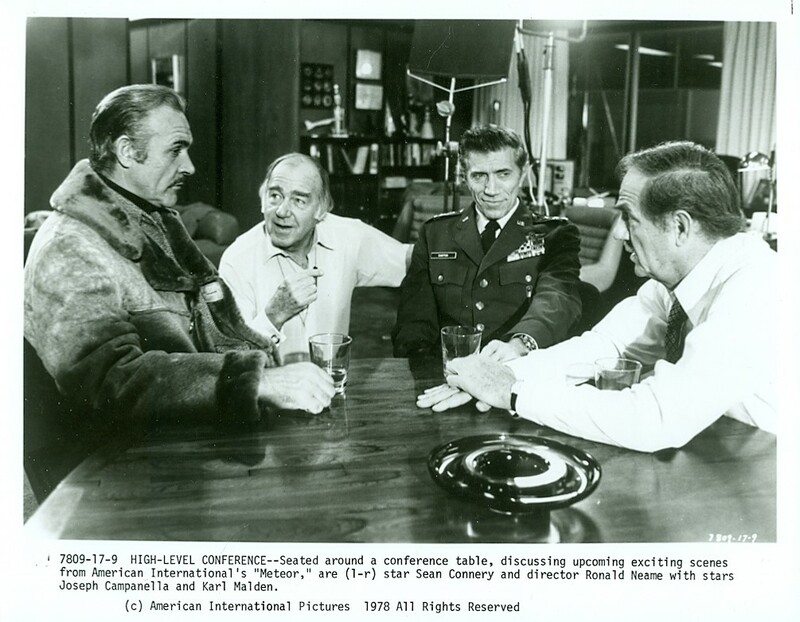 Guy Green is also still here, he was a cameraman on “In Which We Serve” [both have passed away in 2005: John Mills at age 97, and director Guy Green at age 91]. Which are your favourite films that you made later on? 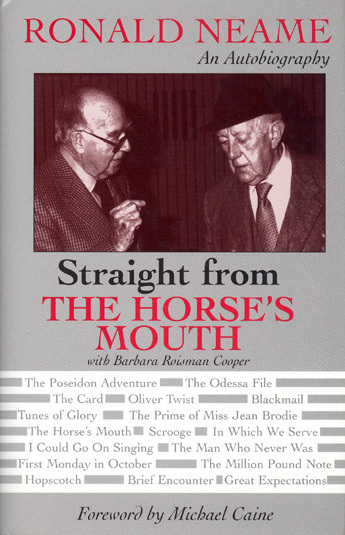 I would say “The Horse’s Mouth” , “Tunes of Glory”  and “The Prime of Miss Jean Brodie” . How did you work with your actors, how did you guide them, compared to the way all those other legendary directors worked? I suppose I come a little bit in the middle between Hitchcock and Carol Reed. I believe that you should get out of an actor the very best that he can give you that he feels good about. In other words: I don’t think it’s right to force an actor to play something in a way that he just does not feel comfortable with, and so if it’s going well, I tend to say, ‘That’s good. That’s good.’ I don’t go beyond that. Now, you take “Tunes of Glory”, right at the end, when Alec makes his speech about the funeral he’s going to give, the way he played that was magnificent, I think. It all came from him, from inside him. We knew we were going to play ‘Tunes of Glory’ as the background music on the pipes, as the dialogue left room for the music to come and go. Alec played that last sequence so beautifully, he did one or two things I never asked him to do. A director can overdirect, not if he’s brilliant, like Hitchcock or like David was. I was not that brilliant, I wanted to make certain that what Alec gave, would go up there on that screen. Johnny Mills played the other part and I said to him, ‘Johnny, whatever magic you bring to me, I will make certain it’s up there.’ And he brought magic to that part, a very tricky part. But there’s one embarrassing thing though I will remember all my life. “The Horse’s Mouth” was shown at the Venice Film Festival which I attended that year. About half way through the Festival, somebody from United Artists came to me and said, ‘Ronnie, Alec will be named ‘best actor’. You must get him over here.’ So I called him in England, and said, ‘Alec, will you come over, everybody says you are going to win, it would be wonderful if you were here.’ He said, ‘Oh no, I don’t like those things, I’m not coming.’ And of course, he won. A couple of years later, we entered “Tunes of Glory” at the same Festival and once again, I was there. People came to me again and said, ‘Alec is going to win again, you know. This time, you got to get him over.’ So I phoned him again and said, ‘Alec, you’re going to win again, please come over this time.’ After a lot of persuasion, very grudgingly, he came over. He was unpleasant to me the entire evening when we ran the film. Well, a few days later the winners were announced and who was the ‘best actor’? John Mills! I thought, ‘What on earth am I going to do now?’ I had gotten Alec over here and it went to Johnny! I phoned Alec and I said, ‘I’m terribly sorry, but Johnny won the award.’ Alec said, ‘So he should, he deserved it, much more than I did.’ End of conversation. Alec could be difficult, but I loved working with this man, and I knew that whatever he said he could do as an actor, he could do. After having appeared in “Great Expectations”, he said he would like to play Phagan in “Oliver Twist”. David and I said, ‘Alec, don’t be silly, you’re 34 years old, how could you possibly play Phagan?’ He said, ‘Do a test with me.’ So we got him down, we made the test. He was a wonderful character to work with. I forced him into playing Marley’s Ghost in “Scrooge”, a small part, and he did it, but he never stopped complaining ever since, saying that I had persuaded him to do something he didn’t want to do. Meanwhile, Alec is gone too, sadly. Right before you started working on a more regular basis in the US, you directed Judy Garland [1922-1969] in her final film, “I Could Go On Singing” , which you made in England. She was an icon in the 1930s and 1940s who had made her comeback in her previous film, Stanley Kramer’s “Judgment at Nuremberg” . So the timing was perfect to work with her? 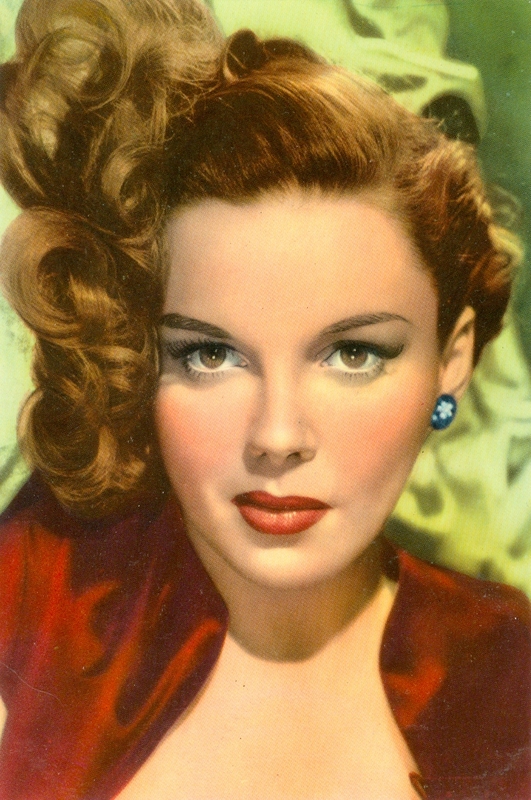 Judy Garland was still a star when we made that film, but we had a terrible time: we had a love-hate relationship. She often had fired her directors, except for Vincente Minnelli. When I was pleasing her, I was her pussycat. But when she hated me, which was about a third of the time, she’d say, ‘Get that Goddamn British Henry Hathaway off the set!’ Henry Hathaway had a reputation of being a bully and whenever she disliked me, she used to call me the British Henry Hathaway. But you’d never know: you’d have four or five wonderful days… thank God for Dirk Bogarde because she really loved him and he was a great help, although it didn’t stop her from throwing her breakfast at him one morning. She tried to get me off the picture right towards the end. She once walked off the set and said she wasn’t coming back, she didn’t care about the film anymore. Arthur Krim [1910-1994] came up to me and said, ‘Ronnie, what are you going to do? She wants you to leave.’ I said, ‘I’d willingly leave, just like that, because I want to see the picture finished, but I have a feeling that it won’t get any better. Tough as it is, if you’ll stand by me, then I’ll go through it to the bitter end.’ And he said, ‘Okay, we’ll stand by you.’ That same day, this was on a Thursday, we stopped shooting for three days and sent Judy a telegram through her agent, saying that if Miss Garland wasn’t on the set the following Monday – which was at the London Palladium, where she had to do her last song – we will cancel the picture and we will sue her. I had to take that chance, hoping she would be there. I called a thousand extras at the London Palladium and they were all there by nine o’clock on Monday morning, but no Judy. I had three cameras and by ten o’clock I turned the cameras around on the audience and I played Judy to the audience, I did all the movements, miming to her voice, and got all the crowd reactions. I had that done by about 11:30. But still no Judy Garland? At twelve o’clock Judy comes in, the make-up man I think asked me, ‘What do you want her to do?’ I said, ‘Tell her to get ready and come to the set, I’ll take her through the song.’ She apparently said, ‘Ronnie’s gonna teach me how to sing? ?’ Anyway, at about half past twelve I took her through the movements and she said, ‘That’s all right, pussycat, let’s do it.’ And she was great! We were out of the theater at six o’clock and for the rest of the film she behaved beautifully. Afterwards she did a long sequence – about six minutes – which was so much like her in real life, the scene where Dirk goes to rescue her from the hospital. It was a very intimate scene, so close. So I planned to start on her as a sort of me figure, and very slowly, as the scene developed, come in to a waste figure. Then at a certain point, halfway through, cut, and I would do the rest in close shots. As we came in, the close shots would get bigger and bigger. So we started the first shot, which was supposed to end halfway through. As the scene went on, I realized more and more that something magical was happening. It was no longer the character from the film, it was Judy being herself. The dialogue was more or less the same, and Dirk, such a fine actor, adjusted to her dialogue. When we were a third of the way through, I knew that something was happening that I’d never get again, because the tears were streaming down her face and it was so genuine, there was no acting about it. We were on a dolly track and I went like this to the man who was pushing the camera, that he’d continue to move in closer and Dirk, who was so intuitive, realized what I was doing so he got in closer to Judy. And then, horror of horrors, a little light on the top of the camera, which was for her eyes, started to burn up as we got closer in. The cameraman signaled to the chief electrician and slid very slowly something in front of this little lamp so that it didn’t destroy the scene. We shot it and it went on for I suppose six minutes. At the end of it, there was nothing I could do but say, ‘That was magnificent. Print.’ We never cut in to the close shots. That was the magic of this woman: despite everything – and God, she put me through some hell – we loved her very much. My wife once asked me, ‘How can you like Judy after all the things she tried to do to you?’ I said, ‘Well, we can’t help it, but we all do, the whole unit.’ And at the end of the film, we were doing a last close shot of her at the Shepperton Studios, a very simple sequence with only two or three lines of dialogue, that I wanted to cut in to another sequence that we had already shot. After the third take, it was excellent and I said, ‘That’s it, Judy darling, that’s really it.’ She looked at me, she looked around at the whole unit and she looked back at me again, and she said, ‘You’ll miss me when I’m gone.’ And she walked away. We were all in tears, she just had this way and we missed her – my goodness, we missed her. I tried to put it down in my autobiography, but you can’t really get anywhere near what this experience was like. How did you handle the camera as a cinematographer and as a director? I probably am a bit old-fashioned, but I was brought up in a school that said, ‘There is no camera.’ We moved our camera all the time, we zoomed and all that, we all disguised the camera movements. If I wanted to get from you to say someone over there in close shot, and I wanted to do it without cutting, then I’d pass in front of you, I’d go with him and I’d be on a new person, and he would not be aware of the camera. Also there are some basic rules that I know should be kept: if you’re shooting a long sequence with characters that are real, you’re working closer as the drama builds. Then, when you get to the high point of the drama, you’re in close shot. What they do today, is they’ll start on a long shot and they’ll track in a little bit. Then, for no reason at all, they’ll cut to a close shot like that, and another one like that, then they’ll come to a medium shot and drop all the tension, drop the drama. They cut at the wrong moment. Up to a point, I don’t understand it, it’s not any longer there is no camera, it’s I am a camera. That is why you get the camera all over the place. There’s now a machine by the way which will turn a steady shot into a shaky one, so it looks that you are filming with a handheld camera. I just don’t think that’s right. I don’t think the camera should intrude, the director should not intrude, he should not want to star in his own film. Because of David’s enormous talent, you’ll always remember a David Lean film, but he never tried to shine, he never tried to show off, he never tried to do any stunts with the camera. There are obviously occasions when you do an action picture, you shoot with handy held cameras to make it look like something that is really happening, but when it’s a story of characters, then you shouldn’t push the camera down the audience’s throat. Do you remember this scene with Judy, talking to this boy who’s her son, when they’re parting for the last time? I had planned to shoot the sequence between her and the boy who’s in the telephone booth: I wanted to cut to the boy, cut to her, stay with her, cut to the boy, like that. We did her sequence after we had shot the boy. So we started filming, she was in bed and began her long speech to which the boy responds and, again, the magic arrived. I tracked in and didn’t cut away at all, I didn’t go to the boy, I could not leave her because she was so good. So I stayed right with her and that was the way it should have been. It would have ruined it to have cut away from her. Filmmakers today have lost that a little bit. If you look back and see what you’ve done and have achieved over the years, you’re a Jack of all trades, aren’t you? I have done everything and that’s a tremendous help: I have been an editor, a cameraman, a producer and a director. So I know I’m a very good Jack of all trades. I think that, if a producer-director team works well together, it is wonderful. My partnership with David during the early years, right up until “Great Expectations”, we worked this close together. We’d take what we had written to Noel Coward and he’d say, ‘Which of my two little darlings wrote this brilliant Coward dialogue?’ Both of us could write his dialogue, we knew him so well. Sometimes he’d give us a little scene and said, ‘Now, get out your pencils!’ He’d walk up and down the room and would dictate the dialogue of the scene, just like that! Noel was brilliant and underestimated as an important entity in theater primarily, but also in film, I think. Another thing, cameramen don’t always make good directors: one of the reasons I think is they want pretty pictures, they want it to look beautiful, they want the best composition photographically. I never hung on to that, I wanted the camera to be where I could show the actor to the best advantage. That’s partly why Maggie Smith won an Oscar for “The Prime of Miss Jean Brodie” and why Alec Guinness was awarded. When I started directing, I chose a cameraman that I knew so I could be happy with the result, people like Guy Green and Ossie Morris. They did exactly what I would have done, so I didn’t have to worry about that. The actors were most important to me, some could be very difficult. I wouldn’t know what makes someone a star, but it is something very special, something unique. “The Poseidon Adventure” , a wonderfully made and commercial blockbuster, is most definitely not the highlight in your career? All I can say is that “The Poseidon Adventure” is not my favorite film, in fact I thought that it would come and go in a few months. But on the other hand, it is my favorite film because it made more money than all the rest of my films put together – and a lot more on top of that. It really should be called ‘the film that nearly never was’ (laughs). A year or two earlier, I made a picture with Cinema Center Films called “Scrooge”, a musical with Albert Finney, and a year later, Gordon Stulberg, the president of the company at that time called me from New York and said, ‘Ronnie, are you busy?’ I said, ‘At the moment not really.’ ‘I have just become president of 20th Century Fox and I have inherited a picture that’s in real trouble. The director has walked out on the producer, the sets are all built and ready to go. The producer has cast several stars, but the script is no good and I have to do something about it. I would like to meet you tomorrow evening at the airport in New York, will you come and rescue me?’ This man was concerned about this one picture, a lot of money had been spent already. And so I put a few cloths together and flew immediately to New York where I met him. Together we came out here in Los Angeles and the following morning I met producer Irwin Allen at 20th. Gradually we became good friends. For six weeks I worked with him on the final script with Stirling Silliphant which we thought was all right – neither of us thought it was the greatest thing we were ever going to do, but it looked presentable. Two days later, Gordon Stulberg told us, ‘I have bad news for you, we are not going to make that picture, we’ll cancel it.’ He said that two of his readers thought the film would be a disaster, which was a good name for it (laughs). We pleaded with him to think it over, bearing in mind a lot of money had been spent already. Then [producer] Irwin Allen did something I will always admire him for, the kind of thing any good producer would do. He was a member of the Hillcrest Club which is right here in Beverly Hills. He went over there and found two very wealthy friends who were playing gin rummy. Irwin said to them, ‘Look, I’m in trouble, will you two guarantee two and a half million dollars for me to make “The Poseidon Adventure”? In other words, if it doesn’t get its cost back, will you guarantee me that amount of money?’ And they said, ‘Oh Irwin, yes, we’ll guarantee you that money, go away, we’re playing gin rummy and that’s more important to us.’ That same evening, at six o’clock, we went to see Gordon and he said, ‘Well, it’s nice to talk to the two of you but I haven’t really changed my mind.’ Then Irwin said, ‘Gordon, the film is only going to cost five million. If I got a two and a half million guarantee from outside, will Fox go in for the other two and a half million?’ Then Gordon said, ‘Oh, that’s different, I’d do that.’ Then Irwin and I sat down. And so, he let the film go ahead and it cost exactly five million. The two gentlemen that guaranteed the money, never put their hands in their pocket, they never came to the studio, they never knew anything about it until the preview and in between, their estates have made millions and millions on “The Poseidon Adventure”. I just got a tiny bit of the profit (laughs), but sufficient to make my life reasonably okay. You also had a wonderful cast. When we shot it, the cast was a tremendous help to me. They all went through everything themselves, there were no doubles – Shelley Winters did her own swimming scene. She was a perfect swimmer, she was a life saver. She did the part, simply because she wanted to do that sequence. All of them, Gene Hackman, Red Buttons, Stella Stevens, Carol Lynley, they were all very helpful. At the end of it, I thought it was all right, I went back to England and had to start working on “The Odessa File”. Three weeks later Gordon Stulberg phoned me and he said, ‘Ronnie, you would be astonished!’ And I was: the reviews were dreadful, the critics ripped it to pieces, but Gordon said, ‘I don’t care about the critics, the picture is going to make millions and millions.’ And it did: at a cost of five million, it grossed about two hundred million. I enjoyed making it, although it is not my kind of film. I would never have made it if it weren’t for Gordon who asked me to come over and help him out of the difficulties. Having worked on the script for six weeks, it was probably better to be made than not to be made, especially when everything was built, constructed and ready. After that, I was offered only disaster films. Everybody thought I was the king of disaster movies (laughs). Since then I made films like “The Odessa File” , “Meteor”  – an unhappy experience for all concerned – and a few pictures with Walter Matthau, “Hopscotch”  and “First Monday in October”  which I loved but didn’t do any business, and I guess I felt there wasn’t any room for my kind of picture. If only television had realised at that time what a wonderful market they are for the intimate film, if only at that time they had spent a little money – they only wanted four cameras and shoot the whole thing in three days, that’s it. That’s why I never went into television, I would have been fired after the second day for being a day behind. Don’t you think you are underrated as a director? I think so, but for better or for worse I saved “The Poseidon Adventure”. It also saved Fox, they would have been in real trouble. The film is an Irwin Allen production, which is fine, I don’t object to that. But it was supposed to be a Ronald Neame film, immediately after the title, and Irwin had my name put down after the cast. He also did some second unit work and whenever he did a few shots second unit, he always made sure a camera crew was there, photographing him, filming him. He gave the impression that he did everything, that was so unfair. I made “Scrooge”  with Albert Finney, nobody really knows that, and “Tunes of Glory”, “The Prime of Miss Jean Brodie” and “The Horse’s Mouth” – most of the credit went to Guinness, and rightly so, with beautiful, impeccable performances – my credits are there, but I always had a low profile. It is astonishing to me that at the end of next month, they are running six of my pictures at the Egyptian Theater here in Hollywood. The idea that six films I directed, most of them about thirty and forty years old, one of them was made fifty years ago, are being show in the center of Hollywood where they had the premiere of “The Poseidon Adventure” in 1972!? I’m proud that the films did hold up. + Mr. Neame passed away in Los Angeles on June 16, 2010, at age 99. TAKE MY LIFE (1947) DIR Ronald Neame PROD Anthony Havelock-Allan SCR Winston Graham, Valerie Taylor, Margaret Kennedy CAST Hugh Williams, Greta Gynt, Marius Goring, Francis L. Sullivan, Henry Edwards. Posted in Film director, Film Talk and tagged A Passage to India, Albert Finney, Alec Guinness, Alfred Hitchcock, Anthony Havelock-Allan, Arthur Krim, Auguste Lumière, Blackmail, Blithe Spirit, Brief Encounter, Carol Lynley, Carol Reed, Celia Johnson, Charles Dickens, Claude Friese-Greene, David Lean, Dirk Bogarde, Doctor Zhivago, Elstree studios, Elwin Neame, First Monday in October, Gene Hackman, Gordon Stulberg, Great Expectations, Guy Green, Happy, Henry Hathaway, Henry V, Hopscotch, I could Go On Singing, Ida Lupino, In Which We Serve, Ivy Close, J. Arthur Rank, James Agee, John Mills, Judgment at Nuremberg, Judy Garland, La Roue, Lawrence of Arabia, London Palladium, Lord Mountbatten, Louis Lumière, Maggie Smith, Major Barbara, Meteor, Napoleon, Natalie Wood, Newsweek, Noel Coward, Oliver Twist, One of Our Aircraft Is Missing, Ossie Morris, Rank Organization, Red Buttons, Ronald Neame, Scrooge, Sean Connery, Sergej Rachmaninov, Shelley Winters, Stanley Kramer, Stanley Lupino, Stella Stevens, Stirling Silliphant, The Card, The Horse's Mouth, The Magic Box, The Odessa File, The Poseidon Adevnture, The Prime of Miss Jean Brodie, This Happy Breed, Thomas A Edison, Time, Trevor Howard, Tunes of Glory, Walter Matthau, William Friese-Greene, William Shakespeare. Bookmark the permalink.